Cookies are small text files that are stored in your browser during your navigation to the internet. These text files are placed by the server of a site and only by this can be used. Their aim is to record the actions of a user in order to offer a better experience to the next visit to this website. 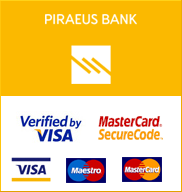 CorfuCityPass.com exclusively uses, widespread and secure Cookies, which do not store your personal data and only provide information to help us improve the operation of our site, to improve our online promotional techniques and help us provide behavioral advertising campaigns. How can I clean my browser from cookies? Moreover you can disable cookies in your browser. We suggest consulting the Help section of your browser or taking a look at the About Cookies website which offers guidance for all modern browsers.